- Thin & Portable design. Tracing light box is super thin and the acrylic surface makes it feel like a glass panel. 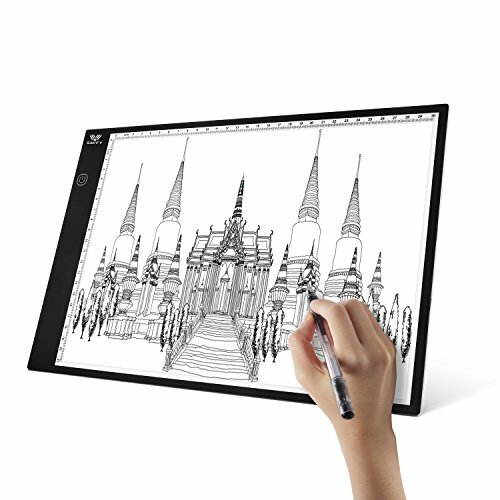 - This Artcraft tracing light pad is a light-up pad, the light from the pad through the paper clearly illuminates the images, which makes tracing images easy. - Amazingly slim, easy to operate. You can take it anywhere with you easily unlike a traditional light box. - Equiped with touch sensor allows the control become easier, turning on/off or adjusting the brightness, simply handling with slight touch. - Power supply by USB cable which mean easy to access to any USB port like computer, USB adaptor or even power bank. 【 ULTRA SLIM & PORTABLE 】 The A4 light pad is extremely thin(only 0.2in) and lightweight which make it portable, stylish and practical. Easy to carry and store. 【 DIVERSIFIED USAGE 】 Ideal for Stenciling, 2D Animation, Cartoon,Calligraphy, Fabric Design, Scrapbooking, Tattoo Transferring, Architecture, Design & Drawing, and even as X-ray viewer in Hospital. Great for art enthusiasts, animators, designers, children. 【 ADJUSTABLE BRIGHTNESS 】 Touch sensor switch design, turn on/off and brightness control easily just by keep pressing the button till you get the ideal brightness. 【 EYE-PROTECTED TECHNOLOGY】Take flicker-free super bright eco-friendly led, uniform and stable light would make you feel comfortable during process. The light guide plate has filtered the harmful rays and protect your eyes. 【 USB POWERED 】 Comes with a USB cable, convenience to access to any USB port like computer, laptop, USB adapter and power bank. Working Voltage: DC 5V, Rate Power: 2.2W. If you have any questions about this product by SAVFY, contact us by completing and submitting the form below. If you are looking for a specif part number, please include it with your message.